Between September and April, we fly model and high-power clicks at arguably the best rocket launch field on the east coast. We have over 3,800 acres of unobstructed recovery area, and a 17,500 ft FAA waiver. 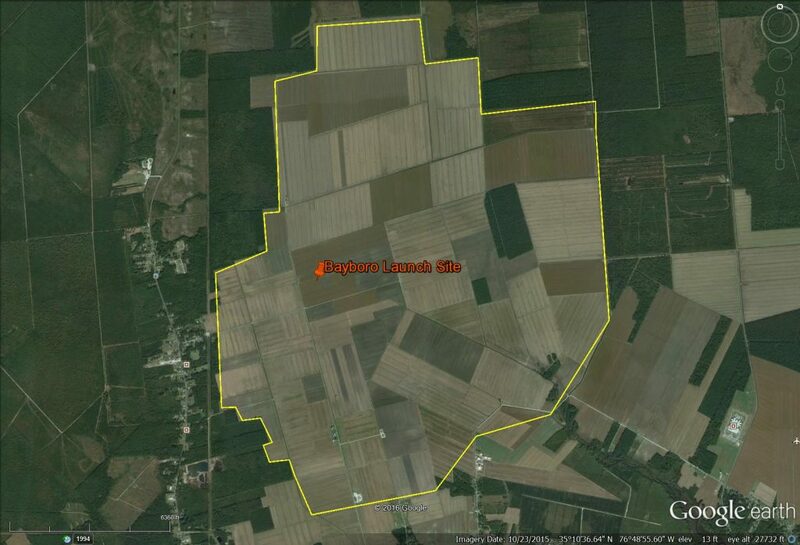 The launch site is near Bayboro, NC (it’s actually in Grantsboro, NC) and is owned by John and Hoyt Paul and farmed by Clifton Paul. They all live very close to the field and we will probably see them at a launch soon. Lots of fast food is available within 3 miles of the launch site for lunch. A porta-pottie is available on-site. To get there, drive to New Bern, NC and cross the Neuse River on US17 North/NC55 East. Approximately one mile after crossing the Neuse River, turn right on NC55 East. Drive 7.5 miles to the crossroads of Grantsboro (NC 55 / NC 306) and turn left onto NC 306 — there is a Bojangle’s on the left corner just before NC 306. Head north on NC306 for 1.9 miles and turn right on Paul’s Farm Road. Continue about 1 mile into the open field area and look for signs and the club trailer. If you are coming from northeastern NC, Greenville or Little Washington, you will probably come down US17 and turn left on NC 55 East at Bridgeton. For those of you traveling via the wonders of GPS, aim your vehicle at coordinates 35.172075 N, -76.831813 W.
We supply launch equipment, usually a bank of model rocket pads and various rod and rail launchers for high power. We have 1/8″, 3/16″ 1/4″ and larger rods. We also have a couple of 8 ft 1010 rails (1″x1″) , a 1515 rail, a smaller 20mm rail, and a large Unistrut pad. Get rail buttons from Railbuttons.com, ask for the 1515, 1010 and mini size. Launches at the Bayboro field are covered by an FAA Waiver to 16,000 ft. Maximum altitude is 16,000 ft for commercial motors, and 14,400 ft for research motors. Rockets are limited to FAA Class 2 (O motors and below) unless you have followed Class 3 procedures. Adult fliers pay $20/day or $30/weekend to launch, children fly free. We use this revenue to maintain our launch equipment and to pay rent to the landowner. We follow the Tripoli Research Safety Code and the NAR Model Rocket Safety Code for launches at Bayboro.